The best-selling history by the 13th-century papal chaplain Martin of Troppau (also known as Martinus Polonus) was a kind of 'Facts-On-File' of popes and emperors beginning with Christ and the first Roman emperor. The convenient listings were usually extended in later manuscripts to continue listings of events during the reigns of subsequent popes and emperors. 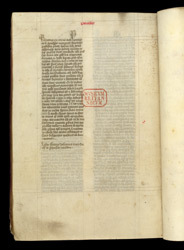 This page comes from a copy from 15th-century Glastonbury. At the top, the heading 'Popes' means, consistent with the page layout typical of copies of Martin's 'Chronology', that it faced a page headed 'Emperors' and concerned events during post-13th century pontificates. This page ends the account of the trial for witchcraft of Lady Alice Kyteler and her son, Lord William Outlaw, in Ireland in 1324, by Richard Ledrede, Bishop of Ossary. At the bottom of the page, a monk of Glastonbury, Brother John Meryenth, wrote his name and identified the manuscript as belonging to the monastery.